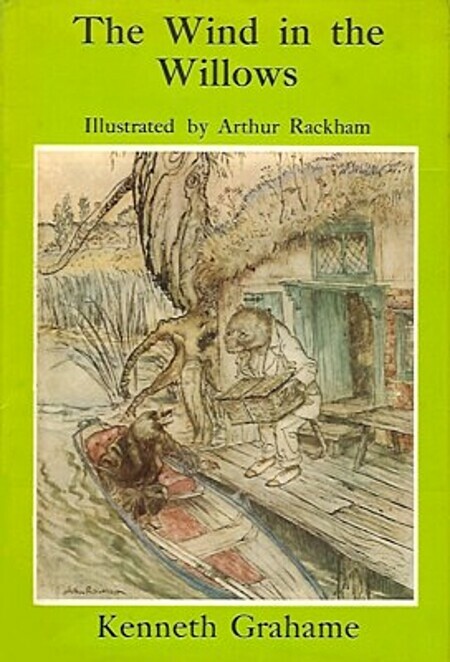 Kenneth Grahame's classic children's novel, The Wind in the Willows, is the story of a friendship, a picnic, an encounter with the divine, a daring impersonation, a jail-break, a secret passage, a battle, and any number of motorcars. It combines at once the fantasy imagination of a bank secretary and the comforts of a well-off British home, peopled by a collection of memorable animal characters whose foibles continue to delight readers of all ages. At least, they delighted this reader! As I read it this time, I was struck by how much it reminded me of C. S. Lewis's Narnia books. Grahame's tone is the closest to Lewis's that I've ever read: genial, oh-so-British, and wonderfully humorous (as when Mole "had started his spring-cleaning at a very early hour that morning; as people will do" (34)). There are also religious/spiritual undertones that occasionally come quite sharply to the forefront, but somehow never jar the tenor of the stories. The presence of the divine is a natural feature of the imaginative landscape of both worlds. Both Willows and Narnia are home to humanized animal characters who reflect all the ideas and mindsets of their creators. And yet these characters are faithful to the quirks of their species as well. I love the part in Willows when it is explained to us that animal etiquette demands that one should never comment on the sudden disappearance of another animal for any reason at all. Of course, Willows was published in 1908, while the Narnia books appeared in 1950–1957. So all my perceptions of Grahame being like Lewis are backwards; really it's Lewis who was influenced by Grahame (in his Poems, Lewis refers to some of Grahame's characters by name). Lewis was by far the most prominent author in my own childhood and so remains the standard by which I measure other similar works, but there is always room for more kindred-spirited literature among my favorites. The Wind in the Willows is regarded as a classic of chidlren's literature, and while it is enjoyable, I'm not sure it deserves that status. The book follows the activities (I hesitate to call some of the trivial things they engage in adventures) of four animal friends: Mole, Water Rat, Badger, and Toad. For the most part, the book follows Mole and Water Rat, who serve as stand-ins for middle-class English country gentlemen. The pair spend their days boating on the river, having very English picnic lunches and dinners, hosting poor Christmas carolers, exploring the enticing and dangerous wild wood, and trying to keep the aristocratic Toad from getting into trouble. One thing that is never clear in the book is why Mole and Water Rat are middle class, why Toad is wealthy, and why Badger is working class, although they all clearly are. The Otter family and the field mouse carolers seems to be poor as well,and the weasels and stoats are essentially poverty-stricken ruffians. No one seems to do any work in the animal worls, so it is unclear why the field mice are poor, while Mole is comfortable enough to have them all in for a bite to eat when they knock at his door. It is a mystery how Toad is able to afford the multiple cars he purchases (and wrecks) in the story. This bit of English class structure, while giving an interesting window on the state of the world in Grahame's era, makes the book more than a little dated, and probably not particularly approachable for a young reader today. For the most part, the four friends putter around doing more or less mundane things - the biggest excitement in the first half of the book is when Mole and Water Rat find and return one of the Otter children who had gotten lost. The actual adventures, such as they are, of the quartet are heavily driven by Toad and what appear to be his attempts to stave off the boredom that comes with being wealthy and idle. He steals a car, gets thrown in jail, escapes, and finds his home taken over by ruffians (Stoats and Weasels), whereupon the four friends arm themselves with clubs, pistols, and swords, and toss the trespassers out. They, of course, immediately plan a party to celebrate. The book is mostly noteworthy for its love of country living, and the unspoiled, but tamed English countryside (the river dwellers being carefully distinguished from those that live in "the wild wood"). In some ways, Grahame is a predecessor of Tolkien, wishing that a pastoral way of life would persist and not be overcome by industiralization and a breaking down of class barriers. "One does not argue about The Wind in the Willows. The young man gives it to the girl with whom he is in love, and, if she does not like it, asks her to return his letters. The older man tries it on his nephew, and alters his will accordingly. The book is a test of character. We can't criticize it, because it is criticizing us. But I must give you one word of warning. When you sit down to it, don't be so ridiculous as to suppose that you are sitting in judgment on my taste, or on the art of Kenneth Grahame. You are merely sitting in judgment on yourself. You may be worthy: I don't know, But it is you who are on trial." "I don't want to teach them, I want to learn them!" I just finished reading this story to my five year-old daughter. She loved it! I sometimes needed to substitute more familiar vocabulary for less to create a smoother read aloud experience. For a slightly older child I wouldn't think this would be necessary. If you have only seen the Disney version, you are missing out. The characters are very genuine and lovable. The adventures they have are exciting without being terrifying, funny without being too silly, and the story is long enough for the reader (or read-to) to connect with the animals. I wasn't sure if the pace would be too slow for a young child, but it was not. The book could be divided into three acts: The River, The Woods, and Mr. Toad. Each story arc was exciting enough in it's own way to keep attention. The addition of so many wonderful full-color illustrations by Inga Moore only helped to hold interest. An important early science fiction allegory (obvious influence on Animal Farm) of closeted gay subculture in Edwardian Britain. 1. Playfulness: It’s pure delight when Mole decides to drop his spring cleaning and begin to enjoy a day of rest and play and leisure in the company of his new found friend, Ratty. Grahame reminds us of this essential part of “human” life, remember to take time of to enjoy life and rest and have fun. 3. Sweet Home (Dulce Domum): The scene where Mole feel homesickness and they decide to find his place and he invites Ratty in to his humble dwellings is priceless. Even the caroling field mice have a feast there. It reminds me of this essential breathing space - a home where meals unite family and friends - an almost holy place where we find renewed energy. 4. Transcendence: How to interprete the chapter “The Piper at the Gates of Dawn”? The mysterious Friend, nature god Pan, this awe and reverence in the presence of something transcendent - the feeling of both joy and sadness. It’s just a miracle. This was my favorite book when I was a child. When I read it years later to my own children, I still loved it, and they did too! If ever there was a more perfect concatenation of material and reader (with a touch of nostalgic memory thrown in), I'm not sure I've heard it. I suppose I was in the mood for this book, but it was a sheer delight and it immediately became a favorite book. My copy has an introduction and afterword, as well as a brief author bio written by Jane Yolen which I really appreciated. We only have a small cast of central characters here, a mole, a water rat, a badger and a toad, 'Mr. Toad'. I adore Mole and Ratty. I found myself loving every one of them, maybe even Mr. Toad. This is a children's book for grown-ups as well as mid aged kids. When I got to chapter 7, titled "The Piper at the Gates of Dawn" my mouth dropped open. My copy only has a few illustrations in it - lovely black and white drawings, and the artist is not credited, although I think I deciphered the name Zimic. Then I decided that artist Tricia Zimic created the delightful cover illustration as well as the interior pen and ink drawings. Itseems a parochial middle-class English allegory worrying about the working-class getting uppity. There's a perpetual fear of the inhabitants of the wild wood - like some kind of housing estate. "They're all right in a way--I'm very good friends with them--pass the time of day when we meet, and all that--but they break out sometimes, there's no denying it, and then--well, you can't really trust them, and that's the fact"
This was the "G" entry in my A-Z challenge based on the unread books I had at my house. I had never read this book as a child - which is too bad because it has such a good message to young people about friends, adventure and going outside of your comfort zone. As an adult reading this book for the first time, it still resonated with me. I am very glad I read it and will probably read it again in another year or so as i would like to revisit Ratty, Badger and Toad. The Wind in The Willows is a highly inventive, very English story about the rich spoiled Toad and his worthy friends, Rat, Mole, Badger, etc. It has become a timeless classic that appeals to all ages. This would make an ideal read aloud story for children as an adult could help with the pacing and perhaps put on interesting voices for the various characters. A morality tale that praises the value of friendship and community, this story has it’s slightly dark moments, but over all it is a gentle tale that paints a strong picture of English country life as we would all wish it to be. This very comforting read delivers it’s message in a subtle, humorous fashion helped by it’s Edwardian pastoral setting and woodland creatures who have very human characteristics. As I child, I tried to read this book several times. Each time, I made it about 1/2 a chapter in and I was bored to tears and stopped. But I kept being drawn back to it for two reasons. 1) It had animals in it and I found that appealing. 2) Disneyland's Mr. Toad's Wild Ride. Come on... a ride like that had to come from a great book!! So I'm now an adult and I'm walking through Borders and I see it on a discount rack. I grab it with the same instinct - knowing it must be a good book. This time, I made it past the first chapter. Midway through Chapter Two, I was hooked. What a beautifully written book. it was absolutely magical and eloquently written. I could just read some of the paragraphs and chapters over and over. My particular favorites were Dulce Domum, The Piper at the Gates of Dawn and Wayfarers All. These are some of the best writing I have read in a long time. The end was a bit of an off trajectory from the rest of the book... but still fun - a little more like Mr. Toad's Wild Ride.... funny though, now that I'm an adult I wasn't as attracted to this aspect. It was the beauty of the chapters noted above. I've known the story of The Wind In The Willows forever, one of those things that seeps in in the time before memory begins, but on the other hand I have no memory of ever having read the book. Warm and clever and lovely, and touched by some sort of magic. It's all the little things like Mole feeling so much more at home in Badger's sett, because he's an underground animal at heart, but loving the river enough to forego that. And Ratty being lovely, and kind and ... Ratty is my favourite. And, it must be said, has been since I was wee. Originally published in 1908, this classic British animal fantasy began as a series of bedtime stories that the author created for his young son, and only found its way into print after Grahame retired from his career in banking. Described as everything from a paean to the beauty of English country life, to a portrait of the class structure of late Victorian Britain, The Wind in the Willows is one of those stories that can be interpreted in diverse ways, and appreciated on many different levels. The tale of four friends - humble Mole, who happens upon a new life and a new social circle one day, when he sticks his nose up out of his burrow; friendly Ratty, a stouthearted sailor and happy-go-lucky river-dweller, who serves to bind the friends together; wise and retiring Badger, who may prefer the solitude of his woods, but nevertheless proves a valuable ally and friend; and spoiled Toad (of Toad Hall), the conceited son of privilege, who has a better heart than either judgment or resolve - it is as engaging as it is well written, and every bit as relevant as the day it was first published. Somewhere alongside a river lives a Water Rat and a Mole, two friends who take pleasure in the simple things, like taking a ride in Ratty's boat and having a picnic. Their friends Toad, Otter and Badger, living near the river and in the Wide Wood, join them in various adventures throughout the seasons. A beautiful children's book which, like so many really good children's books, is still of great interest to adults.